Bijoux Falls Provincial Park is a day use park only. This park is easily accessible off Hwy 97 and provides a view of Bijoux Falls with excellent photography opportunities and a pleasant highway rest stop. Toilets, picnic tables and garbage receptacles are provided. For your safety, please do not venture beyond the fence facing the falls as the area is very hazardous. There is no potable water at this park. Please bring your own drinking water. Help protect the park land. Enjoy Bijoux Falls Provincial Park but please leave it as you have found it so that future visitors may also enjoy the park. The consumption of alcohol in a public place (all areas of the park) is prohibited. Bijoux Falls Park is closed to hunting. 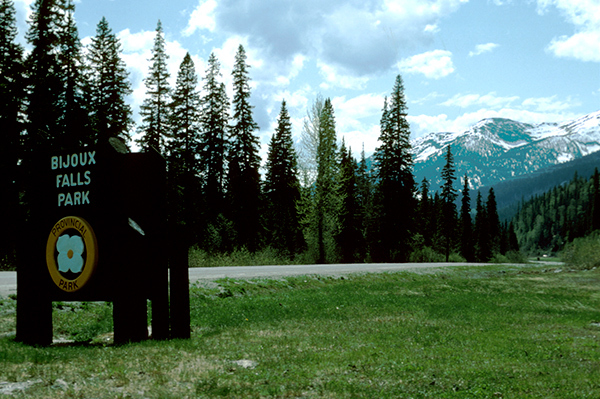 Bijoux Falls Park is located 44 km north of McLeod Lake on Highway 97. The nearest communities, towns and cities are Prince George, MacKenzie, Chetwynd and McLeod Lake. Wildlife: This location is the summer residence for a large Stellar’s Jay population. Park users should always be aware of bears and other wildlife in our park environment. Never feed or approach bears or other wildlife. Visitors can walk around the area but there are no developed trails at this park. There is no viewing platform but there is a fenced off area for viewing a a cascading waterfall. In the summer season, there is a large population of Stellar’s Jays. There is a day-use area at the park that includes 4 picnic tables, 6 pit toilets and 3 large garbage receptacles. There are six pit toilets, two of which are wheelchair accessible. One picnic table and two of the pit toilets are wheelchair accessible.